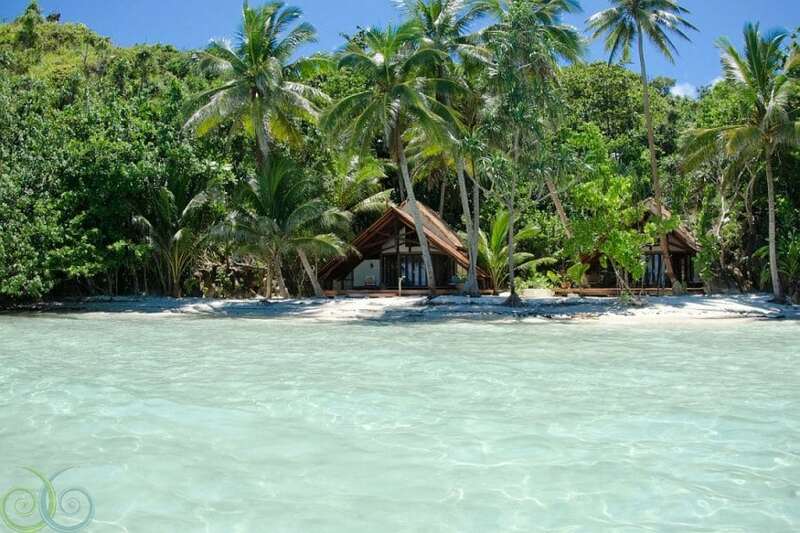 Misool Eco Resort is located on a remote private island nestled in the Misool archipelago deep in the richest most biodiverse area of Raja Ampat. 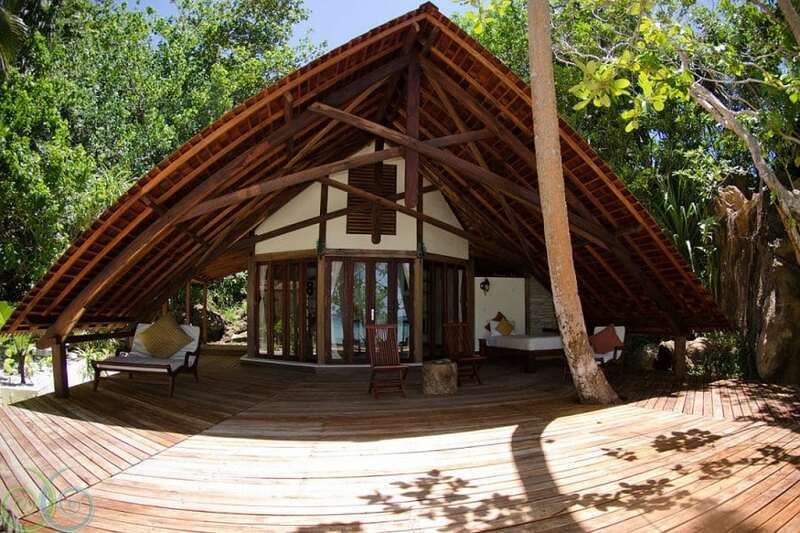 The Misool Eco Resort combines eco and luxury. With a wide variety of individual accommodation configurations, the resort will suit couples, friends and families. The house reef is pristine and available to both divers and snorkelers, and of course, the rest of Raja Ampat is within an hour’s boat ride. Misool features eight rustically luxurious Water Cottages which are located in the North Lagoon, just steps from the Dive Centre and restaurant. The Water Cottages are built on stilts over the water. For lazy afternoons with a good book, there is a hammock built right into the veranda. The view from your veranda is framed by a traditional grass roof, offering a high degree of privacy as well as shade. Stairs lead down from your veranda to the North Lagoon, and the House Reef is just a few fin kicks away. 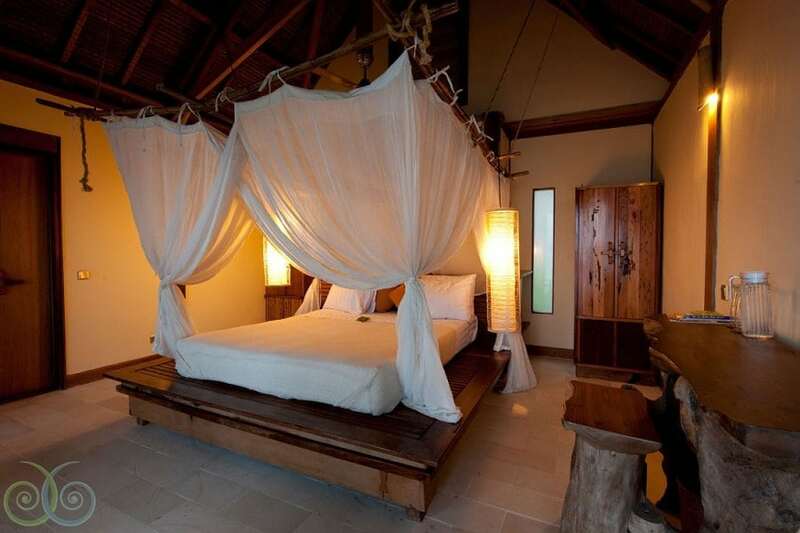 Villa Kalanme is located on the secluded South Beach. This Villa, named after one of the island’s most important spirits, is a complex of three separate en suite bedroom units, with a shared round-roofed living area and huge outdoor living space. 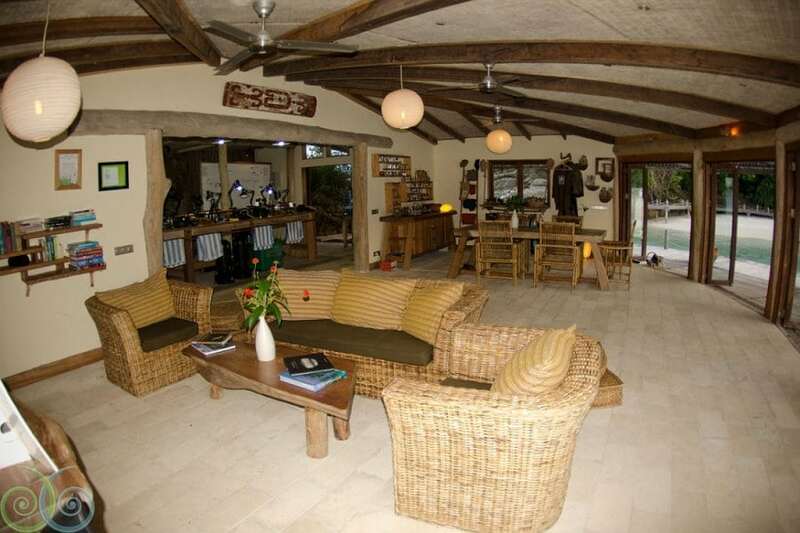 This Villa is particularly well-suited to those who enjoy greater privacy and gorgeous white-sand beaches. Access to this Villa is either by water taxi (on call and reachable by radio), or by a scenic but steep paved path. Villa Santai and Villa Tenang are located at the far end of the South Beach. Two stunning en suite bedroom units are built under the shady coconut palms, with expansive views over the Southern horizon from the huge terraces. Access to Villa Santai and Villa Tenang is either by water taxi (on call and reachable by radio), or by a scenic but steep paved path. Moro Laiyn & Waya Biru Residences, are tucked under the jungle canopy on the South Beach. Just a stone’s throw from the beach, these villas feature a separate ‘pod’ which can be used as a reading area, meditation nook, or lounge. It’s great for couples who want a little more privacy. Villa Utara, also built on stilts on the western edge of the North Lagoon, overlooks the House Reef and the spectacular dive sites of Fiabacet beyond. 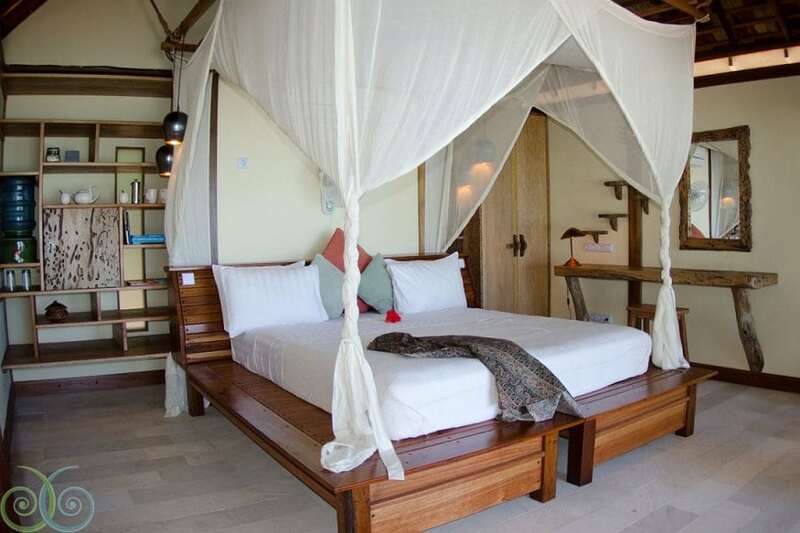 This Villa features two ensuite bedrooms, a shared common area with a half bath, a loft, and a massive veranda. We especially recommend this Villa for families or groups of friends. Villa Tabisasu is located on the eastern edge of the North Lagoon. This Villa, named after the local word for orchid features an en suite bedroom and adjoining living area. The outdoor living-area faces east and enjoys glorious sunrise views, all your own. Villa Tabisasu has steps leading into the water, located at the back of the Villa along the walkway. This Villa is perfect for couples who appreciate a bit more space. Villa Nasnoos & Villa Wakachom are the newest addition to the resort. 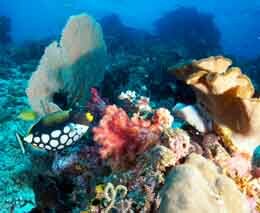 They are located just past Villa Utara on the north-western tip of the north lagoon. Each of these villas have an additional living room. Nasnoos has a queen bed, with the option of a single bed plus roll-away in the living room (so perfect for a family of 4). Wakachom has a queen bed, with the option of an additional double fold-out bed in the living room (so perfect for 2 couples or 2 adults & 2 children). There are stairs from the deck down into the water from both villas, so easy access for snorkelling on the house reef. The electrical voltage is 220V. 110V transformers are available at the dive centre. The power points require plugs with two round prongs (European). 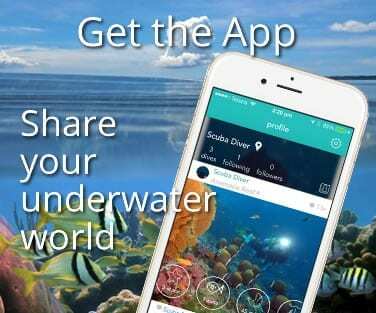 The owners are a dedicated group of divers, conservationists, and adventurers. The local staff working in the restaurant, driving the speed boats, and making up the rooms come from villages on nearby islands, and all helped in the construction of the resort, which is mostly furnished with handcrafted items made from driftwood materials. The resort features its own dive centre. The dive centre is located in the North Bay, on the eastern side of the lagoon, built on stilts over the water. It is spacious and airy, with dedicated wet and dry areas to suit professional videographers, photographers and recreational divers alike. The beachfront restaurant is also located on North Bay, overlooking the shallow turquoise lagoon. The airy, round-roofed structure is tucked back under the trees, offering a perfect respite from the mid-day heat. The restaurant terrace is the ideal place to enjoy a sunset drink while watching the world go by. The menu is tasty and nutritious and offers some organic ingredients from local sources. Misool has a fantastic spa where you can indulge in a variety of massage and beauty treatments, enjoying Misool Eco Resort’s signature range of natural products. Misool’s house reef is a shore dive, easily accessed at any time from either the end of the jetty, the dive centre, or the steps leading down from your Water Cottage accommodation. On a rising tide, jump off the end of the jetty and enjoy an easy drift North through the channel, which is exposed to variable current. Schooling horse-eyed jacks congregate under the pier, joined by massive schools of fusiliers and shoals of passing anchovies. Several very large groupers make their home in the depths under the jetty, and they often appear to inspect visitors to their reef. Larger black tip reef sharks are regularly patrolling the deeper areas, as well as the occasional grey reef shark. For non-divers there is plenty of fantastic snorkelling around Misool. Other activities, like excursions to ancient rock paintings nearby, lagoon and river cruises, bird-watching tours and visits to the local village can also be arranged. Paddleboards and kayaks are available. Misool has WiFi available in common areas. The resort also provides a guest computer in the common area for internet access. No mobile phone coverage is available. The seasonal resort closure is mid-June to mid-September each year. Price includes accommodation as specified, meals, most non-alcoholic beverages, airport pick-up, Speedboat transfer fee on scheduled departure dates and porter services; tanks, weights, air, Nitrox, dive guide, boat, and fuel charges. Also includes one night hotel in Sorong with breakfast and airport transfer in Sorong following your stay at Misool Eco Resort. 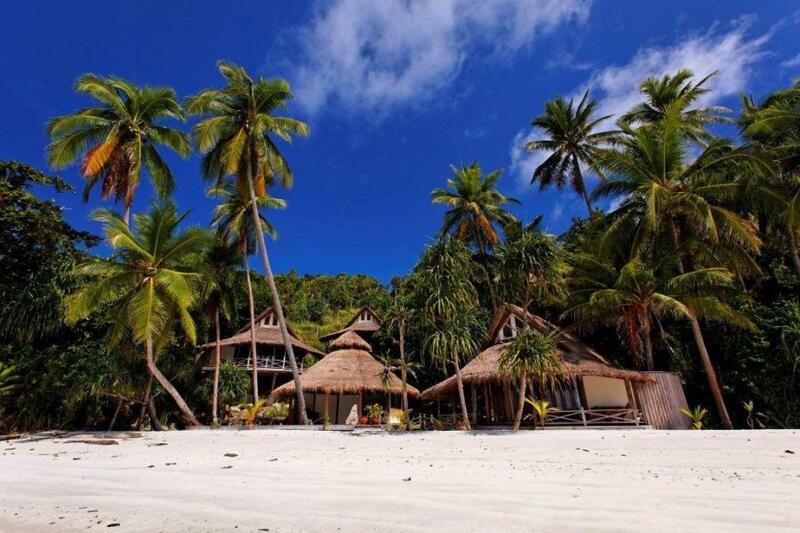 Misool Eco Resort is one of the most remote dive resorts on the planet, located in pristine surroundings on the private island of Batbitim (or Batbitieru according to Google) in the southern region of Raja Ampat, West Papua. The island is nestled deep in a vast archipelago of mostly uninhabited islands, widely considered the richest, most biodiverse dive region in the world. Surrounded by their own 1220 km2 Marine Protected Area, all of their dive sites are within their own patrolled No-Take Zones. Guests cruise to Misool by speedboat transfer from Sorong in about 4-5 hours, depending on sea conditions. Traveling on a comfortable, private 16m speedboat purposely built for cruising Raja Ampat’s waters. It is equipped with 4x 200hp engines, air conditioning and fitted with comfortable seating for 20 guests. The boat is fully equipped with navigation and safety equipment and toilet. The first third of the journey is a scenic passage between the Papuan mainland and small islands of the Salawati group, fringed by mangroves. The second third is an open crossing over generally calm seas, and during the final leg of the journey, you enter the breathtakingly beautiful island chain to which Misool belongs, cruising between sheer cliffs and innumerable small islands, often escorted by dolphins. The resort operates on pre-scheduled dates for 7, 9 or 12 night stays. Guests must ensure to arrive in Sorong before 8am on the scheduled departure day. There is only one boat departure to Misool on departure day which departs latest at 9am. All guests return to Sorong after 7, 9 or 12 nights and stay 1 additional night at a local hotel (inclusive in accommodation package including breakfast). Guests can then depart at any time the following day. Note: The resort is closed during the windy season from mid-June to mid-September each year. Andrew Miner, who has been based in Indonesia for over 10 years now leads the Misool dive team. 20 world-class dive sites are located within a 10-minute ride from the resort, a further 60 dive sites lie within a one-hour boat ride of the resort, and there are many more just waiting to be discovered. Some of the more famous dive sites (all within the 1220 km2 Marine Protected Area established in 2006) include Fiabacet, Boo, Magic Mountain, Yilliet, and Gorgonian Passage. 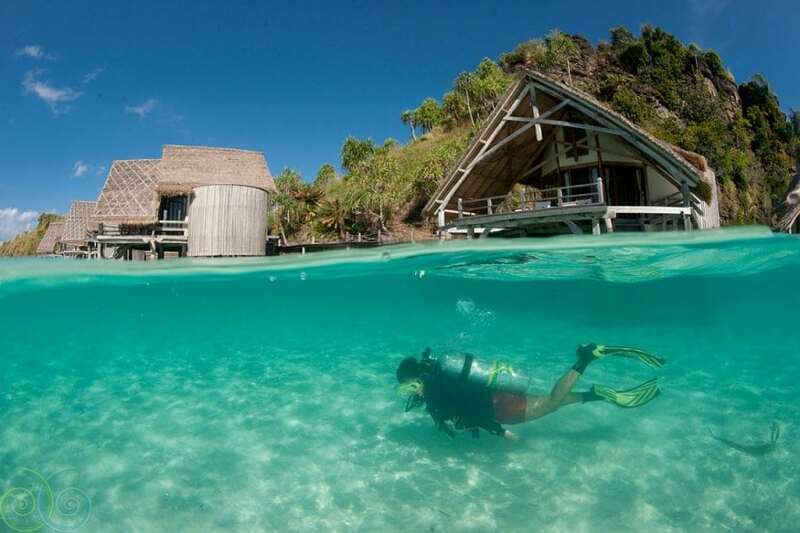 Misool’s Dive Centre is located in the North Bay, built on stilts over the water. The Dive Centre is spacious and airy, with dedicated wet and dry areas to suit professional videographers, photographers, and recreational divers alike. The wet room is furnished with plenty of camera tables and work stations. The kitting up platform is quite roomy. Please note that the resort’s dive shop does not rent wetsuits, mask, snorkel or fins, so you will need to bring those with you. Advance notice must be given for BCD, regs and dive computer hire. Within the dry area, there are comfortable lounge chairs and a monitor for viewing the day’s images. The sunny veranda is perfect for drying out between dives and enjoying the topside views. 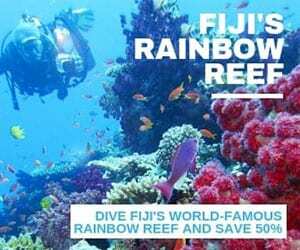 Typically, 2-3 boat dives are offered daily with unlimited and unguided house reef diving, and the thorough dive briefings emphasize individuality and protection of the environment. Dives are conducted in small groups, and gloves are not permitted. Due to their extremely remote location, the dive profiles are very conservative with a maximum depth of 30m (100ft). Misool offers all the comforts of a land-based holiday resort, the variety and quality of diving is comparable with liveaboard diving, The diversity of Raja Ampat’s underwater topography is simply astounding, abounding in all manner of reef systems with walls, pinnacles, caves, swim-throughs, seamounts and lagoons. Visibility is generally 25+ m (80+ft), with temperatures around 26-28°C (78-82°F). For most divers a 3mm wetsuit is sufficient. 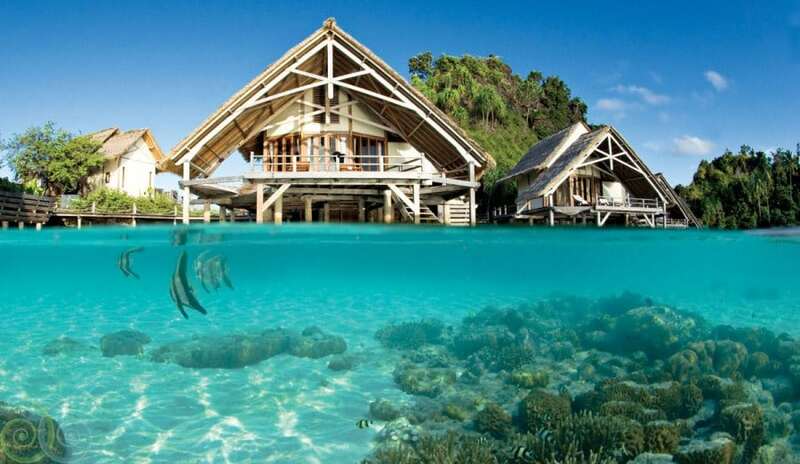 Raja Ampat is home to the world’s richest reefs and dive sites. At the heart of the Coral Triangle, the region sprawls over 180,000 km2 and boasts the majority of the world’s reef-building corals. In fact, in an area the size of two football fields, scientists discovered more than six times as many coral species as live in the entire Caribbean Sea. There are over 700 species of mollusks and 1,200 species of fish. Counted among those is the newly discovered ‘walking’ epaulette shark, commonly seen on night dives on the Misool house reef. Misool’s house reef is a shore dive, easily accessed at any time from either the end of the jetty, the dive centre, or the steps leading down from your Water Cottage accommodation. On a rising tide, jump off the end of the jetty and enjoy an easy drift North through the channel, which is exposed to variable current. Schooling horse-eyed jacks congregate under the pier, joined by massive schools of fusiliers and shoals of passing anchovies. Several very large groupers make their home in the depths under the jetty, and they often appear to inspect visitors to their reef. Larger blacktip reef sharks are regularly patrolling the deeper areas, as well as the occasional grey reef shark. As you drift north through the channel, the topography shifts from a gentle slope to steep wall, festooned with colourful soft corals, huge gorgonian sea fans, and sea squirts and tunicates in a multitude of sizes and shapes. Careful inspection of the many rocky outcroppings, coral bommies, and overhangs is always rewarded with a treasure. A close look at Muricella and Annella sea fans often reveals the elusive Bargibanti and Denise pygmy seahorses. Large and colourful crinoids often cling to the fans as well, hosting a menagerie of colour-coordinated clingfish, crinoid shrimp, and arrowhead crabs. If you time your dive just right, you’ll have a good chance of seeing the stunning Mandarin Fish, who make their appearance just before sunset. A little patience will be rewarded with a display of their wildly psychedelic courtship ritual. They are joined by the spectacular displays of several species of Flasher Wrasse. We also regularly spot the newly-discovered ‘walking’ Epaulette Shark in the shallows, scooting along with their pectoral fins and hunting for their next meal. You’ll also find innumerable species of nudibranchs and flatworms. These range from the gaily coloured black and orange spotted Nembrotha to the huge white Ardeadoris egretta, edged with a lemon yellow frill. It’s not unusual to spot up to 10 different species of nudibranchs and flatworms on a single dive. 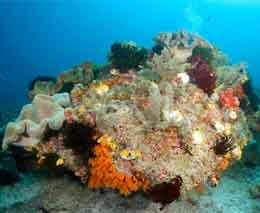 The reef wall is also home to an unrivalled variety of soft corals, hard corals, and sponges, in all colours of the spectrum. They even have fluorescent hard corals! 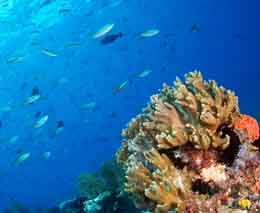 The House Reef is particularly well suited to photographers and those who enjoy observing unusual animal behaviour. Inspect holes in the sandy substrate and you may find the unlikely duo of goby and shrimp. These two share a burrow: the goby keeps a lookout on behalf of himself and the blind shrimp, alerting it to danger with a wiggle of its tail. In exchange, the shrimp keeps the burrow tidy. Stop to watch it bulldoze the sand and pebbles away from the burrow with its claws. We also regularly see octopus hunting or mating in the shallows, and the occasional blue-ringed octopus flashing its vibrant spots in warning. Guests are welcome to dive the house reef in buddy pairs anytime from 8 am to 8 pm if booked on an unlimited dive package. Misool Eco Resort is a fabulous dive resort – from the stunning beauty of the location to the terrific staff and the fantastic diving. All your dreams will come true when staying at this remote location. Even the long traveling times to get to/from the resort are well worth it!